I Heard What You Want! The poll ended two days ago but I procrastinated in posting them till now. For those who participated in this mini survey, a "BIG Thank You" from me. Now I know what you want, hmm...at least the majority....:D, although only 29 voted. The Wire Wrapped Butterfly Pendant is the most popular judging by the poll result (48%). 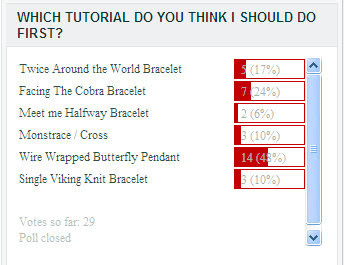 This is followed by Facing the Cobra Bracelet (24%) and Twice Around the World Bracelet (17%). Labels: Tutorials for a Fee , Tutorials for Free Share it!